What is your favorite genre to read or write? What are some of your favorite books in that genre? Is there a particular genre you’d still like to write? What places have you traveled that have influenced your books or places that you would like to travel for a setting of a book? A few favorite things: books, movies, food, TV shows, music, crazy sayings, holidays, seasons, etc. Do you allow your family and friends to read your books as you write them? Do they influence a story by their opinions and critiques? Is there an author who has influenced you? What is your favorite book you have written so far and/or characters? Are there secondary characters you would really like to bring back to become the main characters in a new book? Do you have much say in your book covers? What would you be doing if you were not writing? What is your writing schedule like? Do you set a certain schedule for yourself? How often to you write? Are there a certain number of books you try to accomplish in a year? Do you outline the plot first, or just write? What was it like when you saw your first published book on the shelf? What was it like to win a RITA? 1. What is your favorite genre to read or write? What are some of your favorite books in that genre? I’m very eclectic in my reading. I read almost everything. I haven’t really made much of a foray into the Science Fiction and Fantasy genre. Yet. When I first started writing fiction, I was just as unfocused. I began writing in partnership with my sister. We tried our hands at an American historical (French and Indian War era), a contemporary paranormal ghost story set in Charleston, South Carolina, a WWII suspense, a contemporary suspense set primarily in Egypt, and a historical paranormal set in Charleston, South Carolina. All completed manuscripts. Then, when I began my solo writing career, I decided it was time to pick one thing and get really good at it. I wrote BACK ROADS, a contemporary women’s fiction with a mystery element running thought it. I found I really liked writing this… and apparently I must have been pretty good at it. 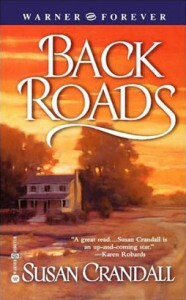 It sold to Warner Books and won several awards. And naturally, my favorite books are all over the map. Let’s see: Diana Gabaldon’s Outlander (a great Scottish historical time travel), Sharon Kay Penman’s trilogy, Here Be Dragons, Falls the Shadow, and The Reckoning (British historical fiction that follows the real folks), Dean Koontz’s Lightning and Watchers, Stephen King’s The Stand, Ken Follet’s Lie Down with Lions, Nora Roberts’ Red Lily, Deborah Smith’s On Bear Mountian, Sweet Hush and Blue Willow. Larry McMurtry’s Lonesome Dove. Of course, To Kill a Mockingbird, Huckleberry Finn and Pride and Prejudice. I could keep going, but I’ll save the rest for a future date. 2. Is there a particular genre you’d still like to write? I think from my previous answers, you’re already guessing the answer to this one. Any and all! Currently I’m currently enjoying my foray into period pieces–1960s WHISTLING PAST THE GRAVEYARD, 1920s THE FLYING CIRCUS. I’m currently tinkering with a story spanning the 60s and 70s. I’d love to do a dark paranormal ghost story again. I’d love to try my hand at a nice meaty suspense that focuses on intriguing characters. Ahh, yes, so many books to write, so little time. 3. What places have you traveled that have influenced your books or places that you would like to travel for a setting of a book? Everywhere I go offers new insight and ideas for books. I’m not a city person, so I like to write about small towns and families. I really enjoy the South. I’ve used many Southern states as settings; Eastern Tennessee for On Blue Falls Pond and Kentucky for A Kiss in Winter, Mississippi for WHISTLING PAST THE GRAVEYARD and Oxford, Mississippi inspired my fictional town of Grover in Magnolia Sky. And of course, the rest of the Glens Crossing Series Back Roads, The Road Home and Promises to Keep take place in southern Indiana. 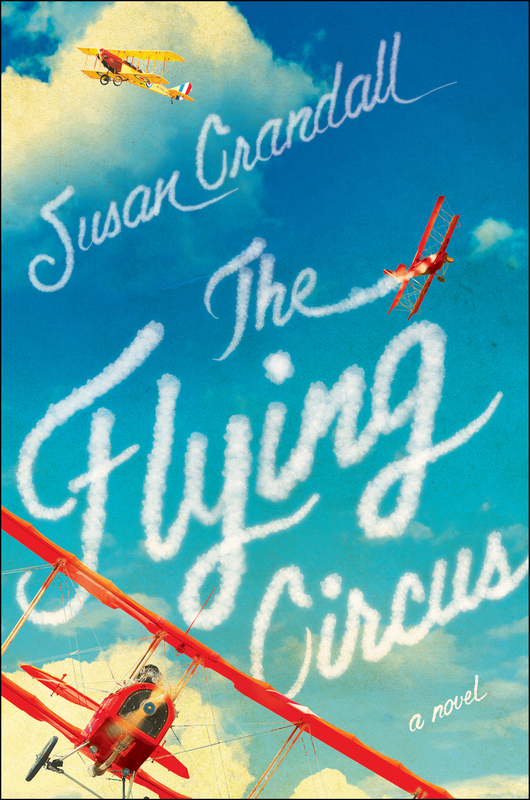 THE FLYING CIRCUS combines many of my favorite locales, Indiana and the Midwest in general, Mississippi, Florida and even a trip to the upstart Hollywood. I’m game to go anywhere and examine the possibility of a book setting. I’d love to go back to Charleston or Savannah and set a book there. I’d certainly be open to something in say, Wyoming or Colorado too. I’m big on green, so I’ll have to think long and hard about desert climates. 4. A few favorite things: books, movies, food, TV shows, music, crazy sayings, holidays, seasons, etc. We’ve covered books. Movies, let’s see, I’m a real sap and absolutely love movies. Every genre has something to offer, character study, story, cinematic beauty, laughter. Here’s my list: Christmas Vacation, L.A. Confidential, Little Miss Sunshine, Saving Private Ryan, Memento, Pirates of the Caribbean, Lars and the Real Girl, . And yes, I admit it, I liked Pearl Harbor and Titanic. Food: I’m particularly fond of salads (the kind with lots of bad-for-you stuff on them), Diet Coke, nachos, Tapioca pudding, watermelon, caramel corn (well, caramel anything actually), pickles, Doritos. As you can see, I’m bad. TV shows: House of Cards, Game of Thrones, Bates Motel, Modern Family, loved The Office, My Name is Earl, Friends and Seinfield when they were on. Music: I love good poetic lyrics. I’m a fan of popular rock; Better than Ezra, my son’s band Blue Sky Goodbye, Rob Thomas, Evanesence, Bon Jovi, Don Henley, Sara Bareillis, One Republic, U2. Christmas is my favorite holiday. I love the fact that I live where we have four distinct seasons, sometimes all within one week. Autumn is one of my particular favorites, but I love snow too. 5. Do you allow your family and friends to read your books as you write them? Do they influence a story by their opinions and critiques? I have critique partners who read my books as I write them. They serve a couple of purposes: they don’t let me cheat and have something unmotivated happen just because I want it to so my plot will work, and they make sure I’m consistent with my character’s personalities and the plotline. I don’t always take their advice, but I do always think about and examine what they have to say. And I suppose you can say they influence the story, they make it stronger and better. My family members don’t see my books until I get the advanced reading copies. 6. Is there an author who has influenced you? I think I’ve probably been influenced in some way by everything I’ve read. I learn something from every book I read, fiction and non-fiction alike. 7. What is your favorite book you have written so far and/or characters? As for characters, I have a very special bond with Starla and Eula in WHISTLING PAST THE GRAVEYARD. I had a particularly difficult time letting them go when I was finished writing. I loved Henry in THE FLYING CIRCUS. I really enjoyed writing Granny Tula in On Blue Falls Pond. 8. Are there secondary characters you would really like to bring back to become the main characters in a new book? As my first four books are a series, I’ve already done this in a way. But there are those whose stories still feel unfinished. I’ve toyed with a storyline for Cole and Becca from Magnolia Sky and I’ve had lots of requests for Riley from The Road Home and Promises to Keep to get his own book. Also, I’d like to give Brian from Back Roads and Promises to Keep his happy ending. 9. Do you have much say in your book covers? I’ve been very lucky and hand beautiful covers. I don’t normally get to see the covers until they are nearly finished. I was given a sneak peak at a couple of renderings and a chance to voice an opinion about the cover for THE FLYING CIRCUS. 10. What would you be doing if you were not writing? Trick question! What would I really be doing? Or what would I love to do? I’d love to try my hand as a casting director for movies. Or even a location scout. In reality, I’d probably be doing something in healthcare, since that’s my educational background. 11. What is your writing schedule like? Do you set a certain schedule for yourself? How often to you write? Are there a certain number of books you try to accomplish in a year? One of the things I like about writing, is the freedom to set my own schedule. Unfortunately, I’m not overly organized, so there isn’t a schedule I keep. And it depends on where I am in a book. The first chapters go very slowly and I have to spend more time thinking and less time actually at the computer putting down the words. I write in two-hour chunks, because if I work longer than that, I start to feel like I’m not making any sense. I’ll take a break and go back for another two hours. I write about 4 hours a day in the early stages and more like eight in the later stages of the book. I’ve found I’m much more productive late in the day. I rarely try to write before noon. When I do, I find myself staring at a blank page and a blinking cursor. I love to write late at night. When I’m in the last third of a book, I usually will write in my two hour segments throughout the day, then sit down at nine and go until about one or two a.m.
I’m a very slow writer. I like to have at least a year between book deadlines, but have written one in six months and WHSITLING took nearly 2 years. Depends on the book. Depends on what else is going on in my life. Deadlines have a way of making me more productive. 12. Where do you write? When the weather is permitting, I write on my screened porch. I love being outside and it makes me feel more immersed in my story. When it’s too nasty for outdoor writing, I usually take my laptop to the chaise in my bedroom. When I’m really close to deadline and have to be at the computer for most of the day and night, I have to revert to my upstairs office, otherwise my back gives me fits. My books are about real people with real problems and conflicts, so I don’t have to look far to be inspired to develop a story. My ideas always start out incredibly small. For instance, BACK ROADS began with an image I had of a car abandoned on a dark country road with the door open, lights on and radio still playing; and a particular family relationship. I built from there. WHISTLING came about because of Starla’s voice in my head and her search for maternal love. Tiny seeds, you see. 14. Do you outline the plot first, or just write? Every author has their own approach to crafting a novel. I never outline. I begin with lots of character development work (finding out exactly who my main characters are, what kind of background they came from, what experiences have they had that make them who they are, what their conflicts are, what they want out of life, what scares them, etc.). I have a very basic idea for plot, beginning, major conflict, maybe a couple of major events, a vague notion of the ending. And then I write. All of my secondary characters and secondary plot lines emerge during the writing process. I did try to write to an outline once. It was a disaster. I felt like it completely hobbled my creativity. Once I crumpled up that outline and let the story unfold on its own I was back in business. 15. What was it like when you saw your first published book on the shelf? It was a moment like no other. My husband and I drove around to all of the bookstores in our area the day it was released. Each time I saw it, I did a quick, quiet, little happy dance. I snuck in and out of the bookstores, feeling like an imposter … my book was on the shelves with Nora Roberts, Mary Jo Putney, Sandra Brown, and Barbara Delinsky! 16. What was it like to win a RITA? Now that was a night! I never dreamt I’d receive such a coveted industry award. The entire evening felt surreal. I can only liken it to your wedding day, much anticipated, but when it actually happens, you feel overwhelmed and just a little detached from the whole thing.